Ride to and from Santiago Bernabeu Stadium – home to Real Madrid football club – by Segway, and visit the stadium and its museum at leisure. On a self-balancing, electric Segway ride through must-visit Madrid squares like Plaza de Cibeles, where Real Madrid fans often gather, and hear tales and trivia about the the city from a guide. Then, glide to the stadium, park your Segway and explore inside at leisure, seeing iconic Real Madrid sites like the presidential box and trophy room. 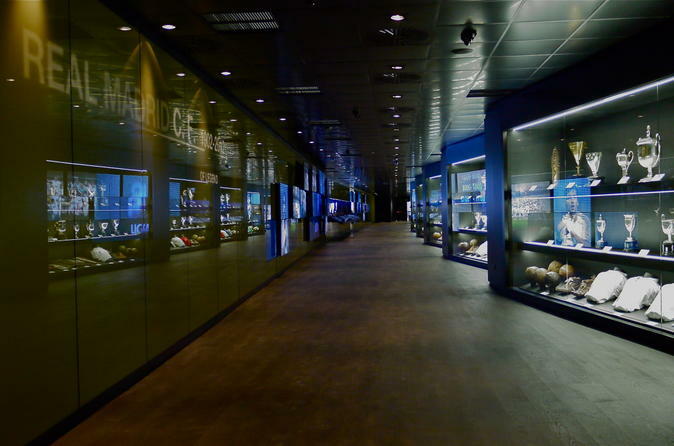 Browse the exhibitions inside the stadium museum, and then return to central Madrid by Segway. Meet your guide in central Madrid and start with an orientation session to get familiar with your two-wheeled, electric, self-balancing Segway. Once you feel comfortable, you’ll follow your guide along the downtown streets toward Santiago Bernabeu Stadium, home to Real Madrid football club. As you glide through Madrid, your guide will point out some of the city’s top attractions. Ride along Arenal Street and cruise past Puerta del Sol – the bustling central square in the heart of Madrid’s historical center. Pass through Plaza de Cibeles, where Real Madrid fans celebrate their club’s major victories, and saunter along some of Madrid’s wide and sweeping boulevards such as Paseo de la Castellana and Paseo de Recoletos. Hop off your Segway in front of Santiago Bernabeu Stadium, and learn about the history of it from your guide. Built in 1947, the stadium has become one of the world’s most prestigious football venues, hosting the FIFA World Cup in 1982 plus several European cup finals. While your guide looks after your Segway, head inside the stadium with your entrance ticket and spend roughly 75 minutes exploring independently. If your group has 20 people or more in it, a private guide will show you around on a tour. Highlights of the stadium include the tunnel to the locker rooms – where famous players like Cristiano Ronaldo and Xabi Alonso have walked – and the presidential box where many a dignitary has sat during a game. See the benches where players from both the home and visiting teams sit and admire the vast collection of trophies inside the trophy room. The stadium also boasts a museum, so be sure to pay it a visit to browse artifacts that document the club’s impressive history. Head to the stadium's café to enjoy your coffee and then meet your guide at the pre-arranged time outside the stadium. Ride your Segway back to the start point in central Madrid where your tour finishes.